One of the most recognizable names in the U.S. experimental scene, Derek Rogers' second release on Bridgetown shatters the canon of his entire history with a surprise from left field. "Don't Stop Bereaving" centers around the exploration of hard panning, rhythms, drastic volume cuts and their interactions with solid walls of sculpted tone. Disorientation plays against stability: a muted piano under rumbling bass, bells ringing through synthesized crunch, fabricated beats bouncing in and out of silence. 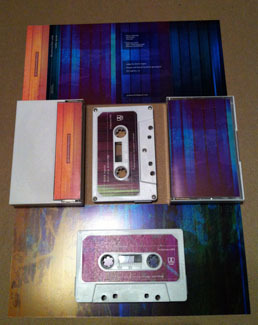 Edition of 100 pro-duplicated chrome cassettes with full-color labels and doublesided printing on heavyweight gloss stock, includes digital download.